On social media as well as e-commerce websites and mobile connectivity, women lag far behind. India’s skewed gender ratio finds reflection in its internet usage as well. Even as an increasing number of people are going online in the country, and the government is aiming to provide internet access to all 1.25 billion citizens, several studies have shown that far more men in India are logged on to the internet than women. For instance, while globally, women tend to dominate usage on major social networking websites, the trend is reversed in India. On Facebook, the world’s largest social networking site that sees India as one of its major markets, there are three men for every woman, according to a recent report by We Are Social, a consultancy firm in the United Kingdom. India’s Facebook population, comprising 76% men and just 24% women, is more gender-skewed than that of neighbouring Nepal and Bhutan. This disproportionate access to men and women permeates across digital services. In India, men are 62% more likely than women to be internet users, according to a recent report by GSMA, a global mobile association. Additionally, men are 25% more likely to own a SIM card than women. This makes India’s digital divide more skewed in terms of gender than any other country surveyed by the GSMA. Several studies bear this out. Last year, a report by the Boston Consulting Group and Retailers Association of India pegged the percentage of women internet users in India at 29% and said the remaining 71% were men. While the report projected that this gap is going to shrink in the coming years, as women will reach a 40% share in internet usage by 2020, the level of digital inequality in India remains staggering. This is of particular concern given that the United Nations in June recognised internet usage as a basic human right. A similar study by tech giant Google and consultancy AT Kearney earlier this year said that only one out of every five e-commerce customers in India is a woman. Google predicted that this share could rise from the current 20% to 40% in the next four years. “Industry will see a 5X+ growth in the number of women shoppers by the year 2020, as top barriers to non-adoption are overcome,” the report said. With regard to female participation on Twitter, a paper last year by the Observer Research Foundation analysed 23,350 tweets over an eight-day period and concluded that women are “significantly underrepresented” in political conversations on the microblogging site, which, it said, reflects their marginalisation in political processes in the country as a whole. The paper found that 46% of the tweets in its sample came from men, while less than 8% were from women. The rest were from organisations and accounts where gender identity could not be accessed or ascertained. “Of the 23,250 tweets sampled under political trending topics, 7.72% of tweets were by women, 46.15% by men, 34.83% by organisations, news outlets and other groups, and 11.30% by users who did not indicate their gender,” the paper said. Even though only 1.6% of India uses Twitter, the study said that the country is the sixth-largest market for the platform and hence, it is reflective of the trends on Indian social media. The study also highlighted how women are often a target of online abuse and trolling. These are findings that the country cannot take lightly, as studies have shown that the internet, which gives people access to a wealth of information, connects people and encourages business, can be a great equaliser. But the gender gap, particularly in developing countries, puts women at risk of being “left further and further behind”. Hence, global alliances like the Organisation for Economic Co-operation and Development measure internet access to women across member and non-member countries regularly. Their report highlighted some of these trends across countries like Japan and UK. Internet usage in India is growing exponentially and the web has reached 462 million active users in India. 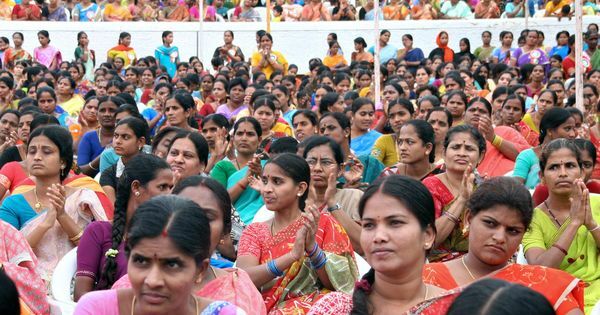 But as long as women continue to stay offline, the Narendra Modi government’s dream for a Digital India, where each citizen has access to the internet, will remain unfulfilled.